I never thought of myself as superstitious, but I guess I must be. When I moved to Charleston, South Carolina in the 1980s, I discovered that Southerners eat a special dish on New Years Day for good luck in the coming year. Hoppin’ John is made with black-eyed peas and rice and served with collard greens. Ever since my first encounter with this delicious tradition, I’ve made it every year without fail, and I’m always glad I do. It’s a great-tasting, comfort-food meal that always tastes “just right” on New Years Day after what is usually a week of rich holiday indulgences. Although, when topped with vegan sour cream and generously doused with Tabasco, it tastes anything but repentant. Sometimes, I cook the black-eyed peas from scratch and use fresh collards. Other times, when I’m too busy to cook, I make a quick version using canned black-eyed peas and frozen chopped collards. Either way, it makes a satisfying dinner and the leftovers are even better the next day. The collard greens are traditionally served on the side, but I like to cook them, chop them, and stir them right into the Hoppin’ John. A splash of Liquid Smoke adds a nice smoky nuance. 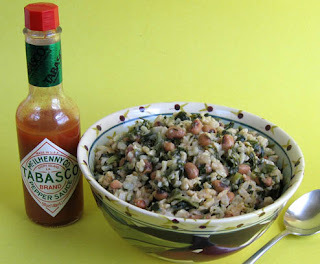 I serve my Hoppin’ John in bowls with the vegan sour cream and a bottle of Tabasco at the table so you can add as much of either or both as you like. Here’s my quick and easy version for you to try — but don’t wait until next New Year’s Day. It’s good enough to eat any day of the year. Use fresh or frozen collard greens for this recipe. If unavailable, substitute kale or other dark greens. 1. Heat the oil in a large saucepan over medium heat. Add the onion, cover, and cook until softened, about 5 minutes. Add the rice and water or broth and bring to a boil. Add salt to taste (the amount of salt needed depends on the saltiness of your broth or if you use water). Reduce the heat to medium-low and cook, covered, until the rice is tender, about 30 minutes. 2. About 15 minutes into the cooking of the rice, stir in the black-eyed peas. 3. When the rice is cooked, stir in the cooked chopped collards, Liquid Smoke, and black pepper. Add more salt, if needed. 4. To serve, spoon into bowls and accompany with vegan sour cream and Tabasco sauce at the table. Dh made collard rolls stuffed with hoppin' john for dinner. It was amazing. We used the leftovers hoppin' john in wraps for dinner tonight. We even froze some of the mix. He made a lot. Nice to know there is a Whole Foods in Mount Pleasant now. How things have changed since I lived there! Thanks for sharing your recipe for Hoppin' John. It looks great not just for New Years, but a perfect weeknight dinner. Julie, You're absolutely correct! Hoppin' John makes a terrific weeknight meal anytime of the year. I'm definitely going to make it more often. That's so funny! I live pretty close to Charleston and I had this on New Years Day too. I just love Charleston, It's so fun to spend the day there. Making a lot of Hoppin' John was a mistake. Dh didn't know how much it would make. LOL.I personally think that it was an amazing wrap. We used garlic tortilla wraps, spread a good amount of Hoppin' John and then some sauteed collards on top. YUMMY.